Surging digital sales helped fuel robust revenue growth at Target Corp. for the third quarter, though the company saw its stock price falter as adjusted earnings per share missed Wall Street’s forecast. Target said Tuesday that for the quarter ended Nov. 3, sales rose 5.7% to $17.59 billion from $16.65 billion a year earlier. Comparable-store sales climbed 5.1%, reflecting an 0.6 percentage point contribution from non-mature stores, according to the Minneapolis-based retailer. Comp-store transaction count grew 5.3%, while basket size dipped 0.2%. Digital channel sales jumped 49% year over year on a comparable basis and contributed 1.9% of comparable sales growth, Target reported. The company said digital accounted for 6% of overall sales in the quarter. Operating income fell 3.3% to $819 million in the third quarter from $847 million a year ago. The operating income margin rate came in at 4.6%, down from 5% in the prior-year period. Gross margin rate declined to 28.7% from 29.6%. Target said the decrease stemmed from higher supply-chain costs due to growth in digital fulfillment expenses and other costs related to the size and timing of holiday-related inventory receipts versus last year, partially offset by the benefit of merchant initiatives. On the earnings side, GAAP net income from continuing operations for the third quarter totaled $616 million, or $1.16 per diluted share, compared with $476 million, or 87 cents per diluted share, a year earlier. Adjusted EPS for the 2018 quarter, reflecting $39 million (7 cents per share) in adjustments to previously recorded provisional amounts from the Tax Cuts and Jobs Act, came in at $1.09 per diluted share versus 90 cents in the prior-year period. Analysts, on average, projected Target’s third-quarter adjusted EPS at $1.12, with estimates ranging from a low of $1.09 to a high of $1.17, according to Thomson Reuters. EBIT (earnings before interest and taxes) decreased 3.9% in the quarter to $828 million from $862 million. In a conference call with analysts on Tuesday, Cornell noted that brick-and-mortar retail is helping to spur sales gains, including from smaller store formats. Target reported that for the third quarter, its stores sized less than 50,000 square feet totaled 68, up from 44 a year earlier. That compared with decreases of three locations apiece for stores of 50,000 to 169,999 square feet (to 1,505) and stores of 170,000 square feet or more (to 273). The retailer finished the quarter with 1,846 stores overall. The strong online sales growth is being driven in part by the rapid expansion of Target’s online fulfillment capabilities, according to Chief Operating Officer John Mulligan. “On the fulfillment side, the progress we have made this year is truly amazing. At this time a year ago, we were in the early stages of testing Drive Up in about 50 stores here in the Twin Cities. Today, we offer this service to nearly 1,000 stores and the ability of our team to deliver consistently outstanding service while scaling up at that pace is remarkable,” Mulligan said in the analyst call. Still, Target’s Shipt online grocery delivery subsidiary continues to see swift growth, Mulligan said. Since being acquired last December, Shipt is now available in more than 250 markets — making the service accessible to nearly two-thirds of the U.S. population — and fills orders for more than 1,400 Target stores, with “a meaningful number” of those orders are delivered in less than two hours, he noted. “While our ship-from-store capability was rolled out several years ago, it also continues to grow rapidly. For the third quarter, in which overall comparable digital sales grew an impressive 49%, our ship-from-store volume more than doubled, while other shipment modes were nearly flat. As we have said many times, the ability to ship from a nearby store is a win-win,” Mulligan explained, adding that in-store pickup also is expanding rapidly and now accounts for about 15% of Target’s digital volume. “We're also seeing strong growth in Restock, our next-day delivery service of household essentials,” he said. Target didn’t provide earnings guidance for fiscal 2019 but affirmed its outlook for the current year. For 2018, the company projects GAAP EPS of $5.41 to $5.61 and adjusted EPS of $5.30 to $5.50. Comp-store sales for the fourth-quarter, including the holiday selling season, are expected to grow about 5% year over year. Analysts’ consensus fiscal 2018 estimate is for adjusted EPS of $5.41, with projections running from a low of $5.32 to a high of $5.51, Thomson Reuters reported. 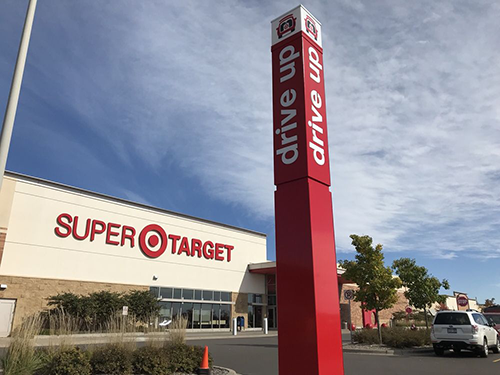 According to Jefferies analyst Christopher Mandeville, Target’s omnichannel investments are bearing fruit, but the retailer’s EBIT growth picture remains unclear.